The weather on Shemya Island can change in an instant. With limited options available for flat roof replacement, the instant-set TRITOflex material was a natural fit. 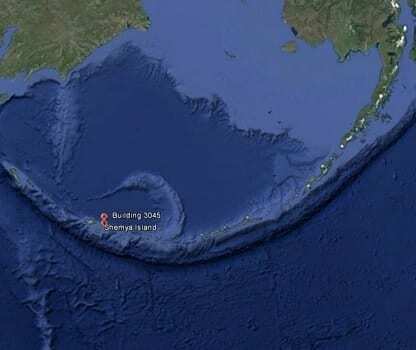 Shemya Island, one of the farthest inhabited islands on the west end of the Aleutian archipelago, is host to the Eareckson Air Station. Building #3045’s EPDM roof system had partially blown-off in a storm and was in desperate need of a re-roof. United Roofing Group was called in to provide analysis and recommendations. With volatile, constantly changing weather patterns in this region of the world, material selection and the logistics of installation were critical decisions. The contractor knew they would need to be creative and think outside of the box. Some sections of the old roof system would have to be torn out and replaced, but most could be left undisturbed to avoid opening up the building to this volatile environment. United Roofing recommended the existing EPDM membrane be covered with a mechanically attached layer of plywood and then immediately sprayed with the instant-set, seamless TRITOflex membrane. With the ability to withstand unforeseen precipitation, TRITOflex creates an instantly watertight membrane. During the summer, temperatures will only reach highs of 60 F. In the winter, snow falls almost daily as precipitation probabilities are nearly 90% half of the year. Therefore, it made sense to select a product like TRITOflex with great cold-temperature flexibility, UV resistance, impermeability, and the highest wind uplift ratings in the industry. Areas of saturated insulation were torn out, replaced, and repaired. A layer of plywood was mechanically attached over the existing EPDM roof system. 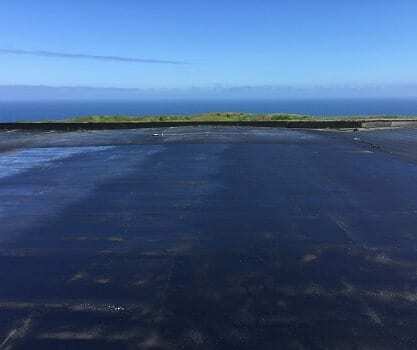 As the cover board was installed, certified spray technicians used two spray rigs and installed the water-based, VOC-free TRITOflex rubber membrane in one coat to 80 mils (2 mm) dry. The TRITOtrowel brush-applied liquid rubber is then used around drains, scuppers, and flashings for extra reinforcement. The Air Station received a new, watertight roof to withstand the harshest Shemya Island weather patterns and is backed by a 20-year warranty that covers wind up to 130 mph. Another roof completed with quality products installed by quality people.